As you’re surely aware, the brake system is one of the most important parts of your car in terms of safety and driveability. While you use the system hundreds of times per day, you likely don't often give it a second thought. The system of parts that makes up your brakes includes discs, pads, and calipers, all of which work together to slow your car when you press on the brakes. Keep reading to find out how to ensure that you can always depend on these parts seamlessly cooperating as you go about your daily life! How can I know when I need new brake parts? As you drive, it is normal for your brake parts to accumulate wear over time. Eventually, it will be time to get replacements. If your car doesn’t immediately come to a stop when you press down on the brakes, you hear a loud squealing noise, or you feel strange vibrations, your brake pads might be worn down and need to be replaced. If you notice any of these phenomena, try to get your vehicle in to see a professional as soon as possible. Do I need to get brake maintenance? While brake service may not be near the top of your priorities list and replacing parts can be costly, it is very important in ensuring the safety of you and your family while you are on the road. Bringing your car in for brake service should be simple and painless. The experts at all Metro Motor locations can get your car fixed and back on the road again in no time. Service involves checking brake fluid levels, flushing the brakes, and changing the brake pads. The rotors should be checked as well, because they are what work directly with the brake pads to stop the wheels. We will also fully inspect the system to make sure that all of the other parts are working together correctly and see if anything else needs to be replaced. 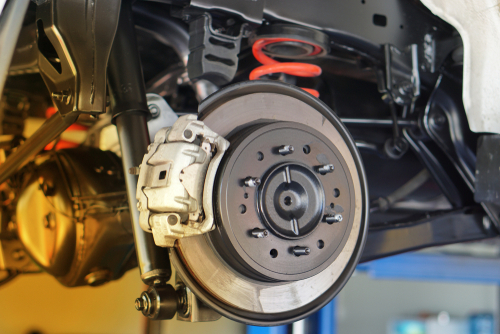 Brake system maintenance is key in avoiding scary and costly brake failures down the line. At Metro Motor, we offer quick, convenient service at a reasonable price that will keep you driving at ease. Contact us for more information or book an appointment today!